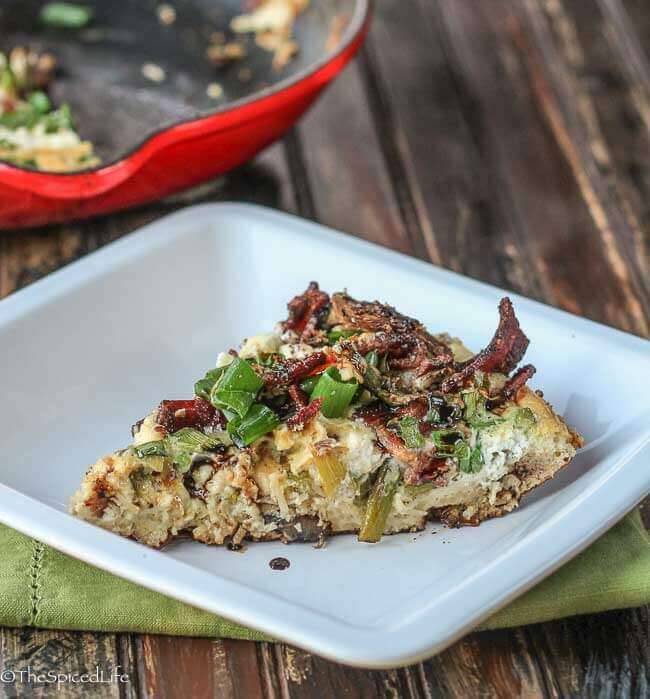 Creamy Pasta Frittata with Bacon, Asparagus and Goat Cheese is a delicious breakfast or brunch centerpiece, and drizzled with balsamic vinegar it makes a light and elegant dinner entree. 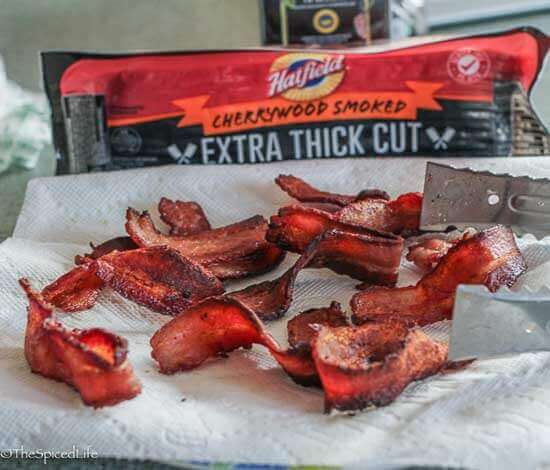 When I was asked to create a recipe using Hatfield Quality Meats bacon, I was immediately intrigued by their Cherrywood Extra Thick Cut Triple Smoked Bacon. As far as I am concerned, the thicker the better when it comes to bacon (having said that, their Classic Sliced Bacon would work fine in this recipe too if thinner is what floats your boat). And having always loved apple-wood smoked bacon, I could not help but be curious about cherrywood. Delicious. Man, I love bacon. For me personally, when I hear Easter, I think eggs. 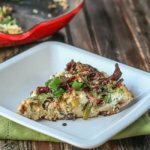 So, when I was thinking of a recipe that features Hatfield® bacon, my first thought was quiche, and indeed this dish is heavily influenced by quiche, but since returning home from Italy, I have been obsessed with pasta frittata. Now in Italy, from what I saw, some form of tomato is often included in the pasta frittata (such as tomato sauce or paste), but I wanted cream to emphasize the similarity to quiche, which just strikes me as more of an Easter brunch dish. So, think of this as a hybrid. A delicious fusion of the two. One of the great purposes of frittatas is, of course, to use up leftovers. Now as it happened, I did not use leftovers for this dish because I was creating the recipe. But the pasta, roasted asparagus or bacon could all be leftover or made in advance (although be sure to reserve the bacon grease, which I always do anyway–it lasts forever in an airtight container in the freezer). For that matter, the mushrooms could also be cooked in advance, although it would be rare for me to have just plain sautéed mushrooms leftover. And if it seems like too much, get rid of the mushrooms. Personally, I like rustic one pot dishes brimming with veggies, and mushrooms harmonize perfectly here. If I had to guess, the Aceto Balsamico (balsamic vinegar in Italian–and I spell it that way because you want to make sure to be using a good quality balsamico here) might strike some of you as odd. 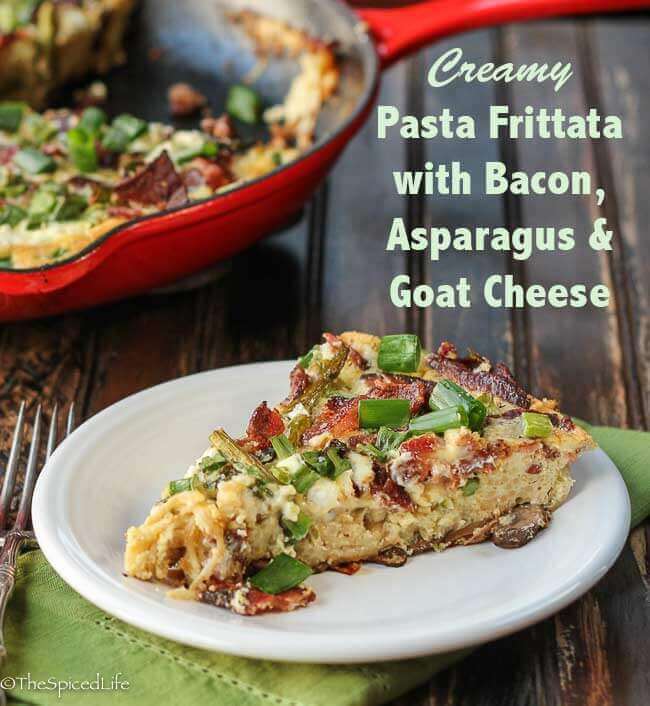 First, if it just seems too weird, have the pasta frittata without it. It is delicious either way. But second, don’t be too quick to write it off! The syrupy sweet and sour balsamic is a perfect counterpoint to the smoky, salty bacon and relatively bland eggs. All four of us preferred the balsamic vinegar on the frittata. 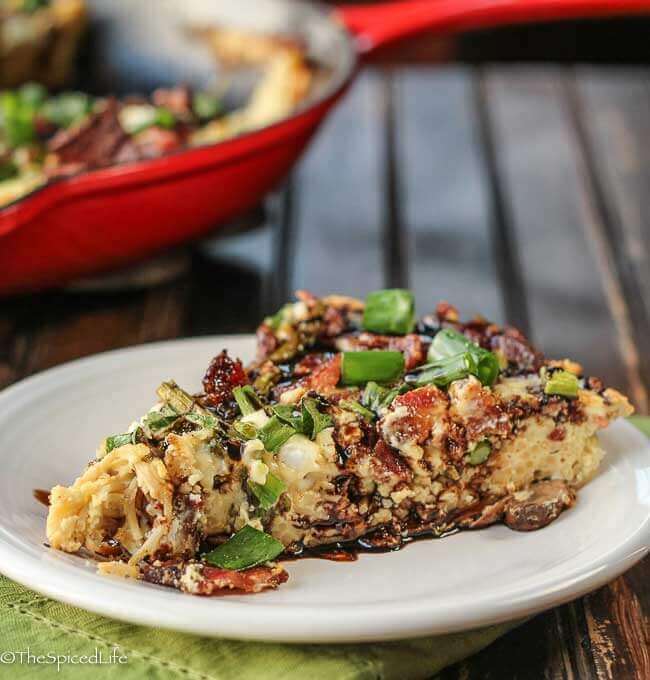 Delicious on its own, this quiche-frittata hybrid is even better drizzled with a good quality balsamic vinegar. Any of the pasta, bacon or asparagus can be made in advance and leftovers used, in which case note that you should reserve the bacon grease after cooking the bacon. The instructions assume that you are making all of the components for this dish. If you are adapting or substituting in this dish, I highly recommend adding the bacon and green onions close to last. The green onions so they do not cook much, and the bacon so that it is only partially covered by the eggs, and therefore stays crispier. Begin by starting the water boiling for the pasta. While the pasta cooks, begin the asparagus. When the pasta is done, rinse briefly with cold water to prevent sticking. Clean the asparagus and break off the bottom ends. Gently pat dry, and place on a rimmed baking sheet. Drizzle with a tablespoon or so of olive oil and sprinkle with salt and pepper. Roast the asparagus until it is browned and tender. Drizzle with 1-2 tablespoons of inexpensive balsamic vinegar. Let it cool for a minute or 2, and then remove to a cutting board and cut into bite sized pieces. When the asparagus is done, lower the oven temperature to 350 F.
While the pasta is cooking and the asparagus is roasting, fry the bacon in batches in a cast iron (enameled is fine) 12-inch skillet. Periodically drain the pan of bacon grease and reserve the grease in a small bowl. When the bacon is done, add 3/4 cup water and 1-2 tablespoons inexpensive balsamic vinegar to the pan to deglaze it and scrape up all of the yummy bacon bits. Let the water boil off. When the water is mostly evaporated, add the mushrooms with a pinch of salt. Add a teaspoon or 2 of bacon grease. Fry, stirring occasionally, until the mushrooms are cooked. Toward the end, add the chopped whites of the green onions to the mushrooms and fry them a bit. While the mushrooms are cooking, place the eggs and cream in a deep bowl. I used the whisk attachment of an immersion blender; whatever you use, vigorously whisk the eggs and cream until they have lightened and thickened a bit. Whisk in a pinch of salt and some freshly cracked black pepper. When the mushrooms are finishing cooking, use a heat-proof brush to brush bacon grease around the sides of the skillet. Add a tad more grease to the pan if the mushrooms seem dry. Spread the cooked pasta over the mushrooms. Sprinkle the roasted asparagus evenly over the pasta. Sprinkle the crumbled goat cheese evenly over the asparagus. Sprinkle the chopped bacon over the asparagus and goat cheese evenly. Sprinkle 2/3 of the remaining chopped green onions over the bacon, and then pour the whisked eggs and cream over everything. 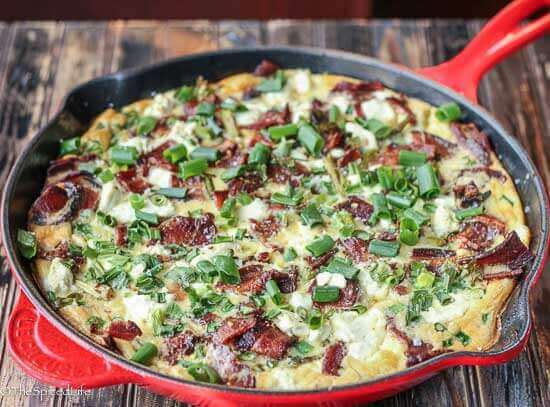 Sprinkle the frittata with flaky sea salt and bake for 20-25 minutes, until the eggs are set, the edges are puffy and coming away from the edges of the pan, and a knife inserted into the center of the frittata comes out mostly clean (try to avoid the goat cheese blobs). Sprinkle the remaining green onions over the frittata. Let the frittata set for 5 minutes before slicing. Drizzle with a high quality Aceto Balsamico if desired. Will you use bacon in your Easter dishes this year? I will! I made a bacon-lattice topped quiche last year for Easter Brunch. I have a feeling it’s going to become a tradition. I always add bacon to my macaroni and cheese along with broccoli and caramelized onions. We also wrap asparagus in bacon. I will make bacon for Easter brunch! I love bacon. 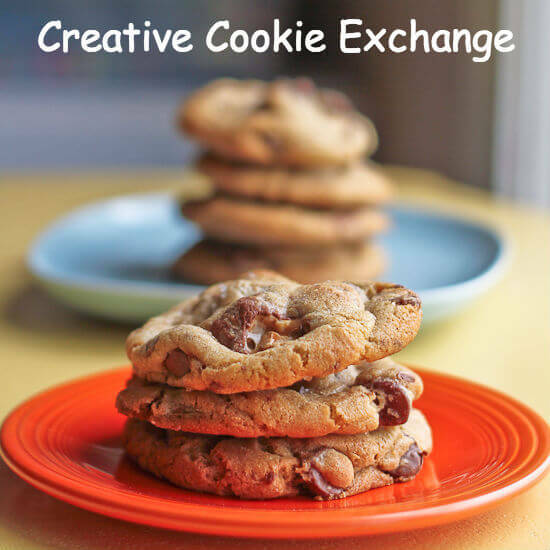 Would be totally down to use it in my Easter recipes this year – would be a hit for sure! Yes, we use it in Easter recipes. I use lots of bacon on Easter! I add bacon to my mashed potatoes, egg quiche and I also do bacon wrapped pork tenderloins. https://twitter.com/areck0001/status/845100697746071552 I tweeted. Thanks so much. I think that bacon and saparagus with some goat cheesse would be ooohhhhhhhhhhhh so good! Lol Yummy. I like all the mixed flavors of the meal. 5 star. No special Easter meal this year – but I love bacon on my mac-n-cheese! And bacon wrapped shrimp is delicious! I won’t be using bacon in my main dish because I’m making lasagna but I will make bacon for Easter breakfast. I am not too sure but thinking about it!! I love to make a large batch of bacon in the oven to crumble into salads or over eggs for breakfast! You never know when you might need it! I love bacon! I will bake off a couple of sheet pans, so there’s enough to use for that tempting looking frittata recipe, as well as use in pasta dishes, or simply on a bacon cheeseburger. We add bacon as a topping to almost anything so yes! I will be topping bacon on my potatoes that I make this year. Yes, we’ll use some bacon in our deviled eggs. I’m not sure if I will use bacon in our easter dishes because our main dish is ham. That being said, I’m pretty sure I use bacon on everything! I was making roasted brussel sprouts with bacon regularly and one day I didn’t have bacon so I made them without any and my husband really didn’t want to eat them! I will! I will use it in my salads, and also on my eggs! I would make slow cooker creamed corn with bacon. Yes I use bacon in my Quiche I make Easter morning. I use bacon in a layer salad I make for Easter dinner. It is delicious! Can’t go wrong with bacon! We often use bacon in green beans or macaroni and cheese. I am not too sure but I am definitely inspired to now. I always use bacon in my baked beans at Easter time. Yes. I will be making a Sunday Brunch Casserole that uses lots of bacon — plus cheese, hashbrowns, etc. I might add some bacon to a pea & mushroom side dish I’m thinking of making. I am going out to dinner for Easter. I do not eat bacon, I will be going out to eat. We’re making bacon wrapped scallops as an appetizer. Yes, I will be putting crumbled bacon in my twice baked potatoes recipe this year for Easter dinner. I will not be using bacon in any of our Easter dishes I may put some bacon bits on a salad. We will use bacon in the mashed potatoes this year. I will probably use bacon! I didn’t serve bacon in anything this year. We had ham for our Easter dinner.